Last month, I ordered my first paleta at our neighborhood Mexican restaurant. It was a simple avocado popsicle–made of nothing more than water, sugar, lime, avocado, and possibly some dairy. But it was mind-blowingly good. Having grown up in California, I am not quite sure how I missed the boat on paletas, which are Mexican ice pops. All I know is that I’ve been a popsicle-making machine ever since–making up for lost time, I suppose! 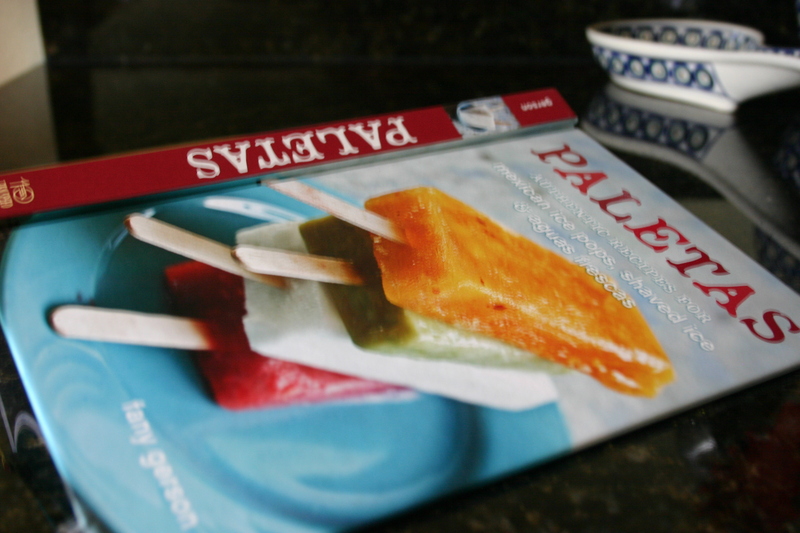 I’m currently working my way through Fany Gerson’s Paletas cookbook, which includes wonderful recipes for paletas, shaved ice, and aguas frescas. Fany owns La Newyorkina in NYC, and has fabulous paleta recipes including spicy pineapple, lime pie, coconut, strawberry, and more. Since I received a beautiful, fragrant cantaloupe on my produce box last week, I decided to try out Fany’s recipe for paletas de melón. 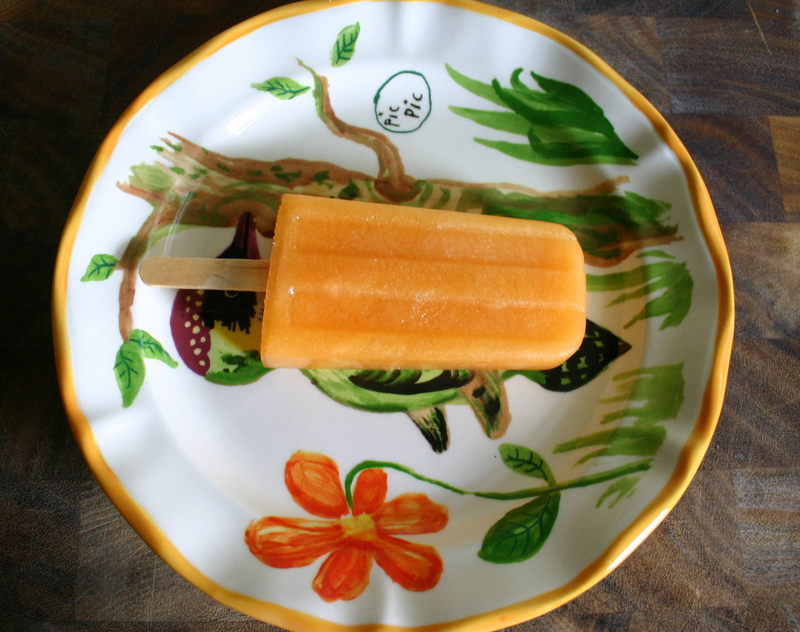 This was not your average store-bought popsicle. You can actually taste the freshness of the cantaloupe and the natural orange color really pops (pun intended). This is a fun and creative way to serve in-season fruit, and they are great for kids and grown-ups alike. 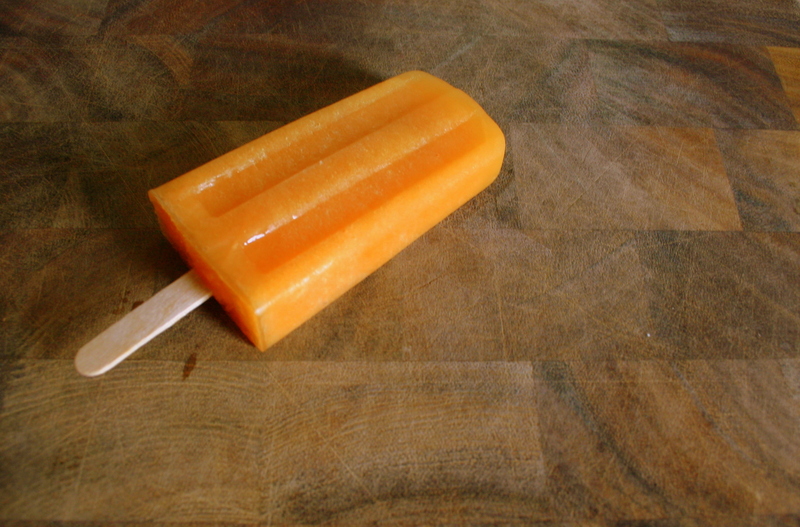 There are dozens of popsicle molds out there in a variety of shapes and sizes. I bought this inexpensive starter mold off of Amazon.com, and have been pretty happy with it. It doesn’t have all the bells and whistles of the more expensive molds, but it is made out of BPA-free plastic and gets the job done. Fany also mentions that you can get creative with your own unconventional molds by using tall shot glasses, for instance. 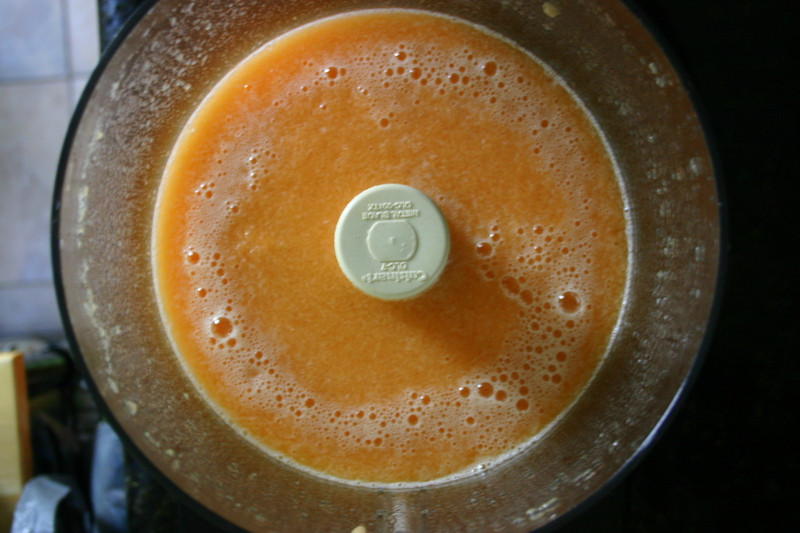 Combine water and sugar in small saucepan and cook over medium-high heat, stirring, until the mixture comes to a boil and the sugar has dissolved. Let cool to room temperature. Pour the sugar syrup into a food processor or blender. Add the melon, lemon juice, and salt and blend until smooth. If using conventional molds, divide the mixture among the molds, snap on the lid, and freeze until solid, about 5 hours. 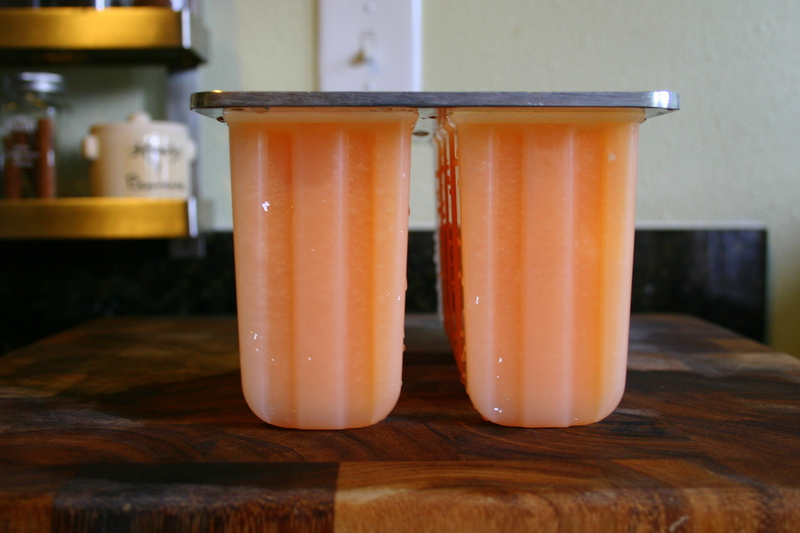 If using glasses or other unconventional molds, freeze until the pops are beginning to set (1/2 to 2 hours), then insert the sticks and freeze until solid, 4 to 5 hours. Homemade popsicles are my new summer obsession. 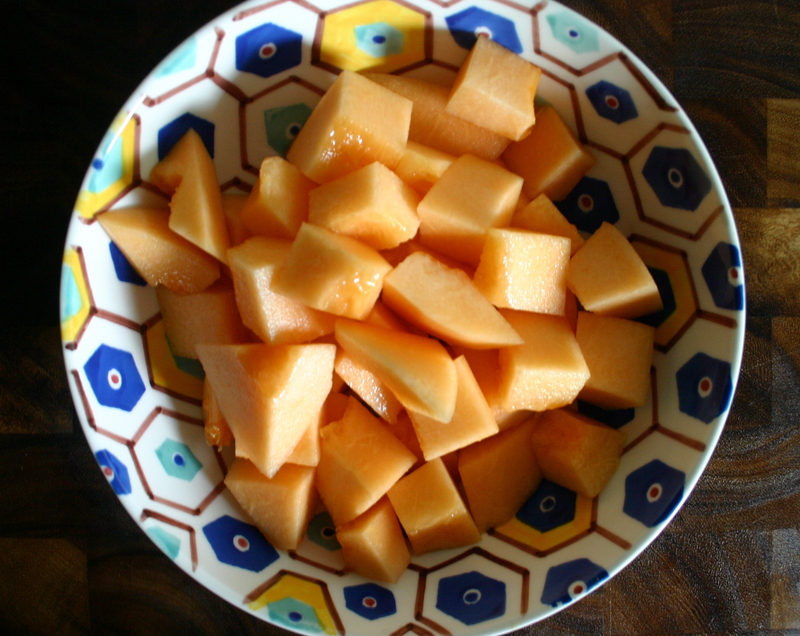 Make sure your cantaloupe is ripe and fragrant, and cut it into bite size pieces so it will blend easily. Using a blender or a food processor, blend until nice and smooth. Although, I am definitely not opposed to an occasional small chunk of cantaloupe in my popsicle! Fill the popsicle molds leaving a 1/4 inch of space from the top. The mixture will expand in the freezer. Turn up your freezer to the highest setting and let the popsicles set for about five hours. I got nine popsicles out of this recipes, but this will of course depend on the size of your cantaloupe and your molds. 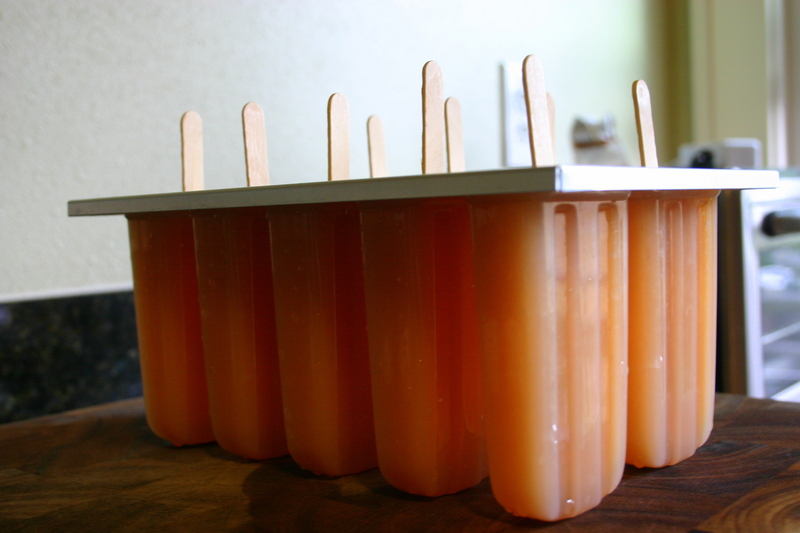 To release the popsicles, run the mold under some warm water and wiggle the pops out. You can store them in individual baggies, keep them in the mold until you are ready to eat them, or eat them all on the spot! this looks amazing! Did you try the avocado one. Where do you get the popsicle molds? Thanks, Carol! I got the popsicle molds off of Amazon.com–it was one of the cheapest models, but it works well. I did try the avocado pop recipe from the cookbook and it was very good and super easy to make. However, I think it is a little too rich to eat on a daily basis for me. It makes for a good treat every now and then! I have been eyeing this in the last issue of Saveur! It look delicious!! Can you make them all year round? haha nice! well keep posting about it, especially in the winter months… if you do it… I might try it here next spring! that would give me something to do with my strawberries… lol, im addicted to them right now. This is a great way to utilize strawberries too! There is a recipe for strawberry paletas which basically uses the exact same ingredients–fruit, sugar, and water. So simple, and so delicious! i haven’t had a popsicle in such a long time. these look really yummy and refreshing, lauren. i will have to try it out! Hey, Linda! Let me know what you think if you have a chance to try them. Hopefully we will have a few more popsicle-worthy sunny days here in Seattle! i am drooling for one of those popsicles! Do you have a suggestion for a refined sugar replacement? I’m wondering if white grape juice might be good? If so, how much? Never miss a post again. Receive notifications of new posts by email. Spam NOT included!